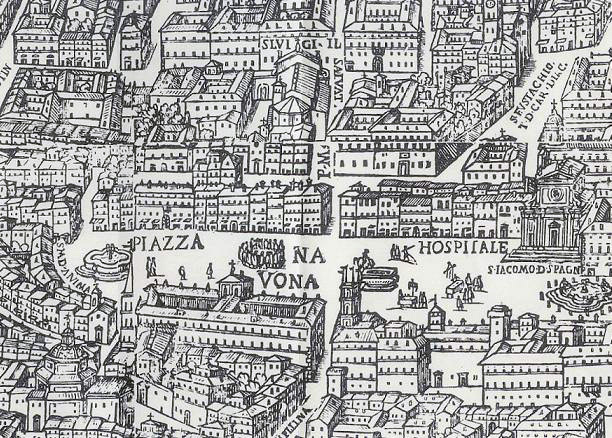 Architects of the Renaissance created the concept of the Piazza in the 15th century, a redesign of the urban landscape into marketplaces and public spaces surrounded by buildings. Piazze (or Piazzas if you wish) still define the Italian city. They were used for religious and political propaganda, commerce, festivals and public executions. They are a second home for Italians, places to gossip, catch up on the local news, show off new fashions or new lovers or just enjoy an evening stroll with the family. To find out what Italian life is all about, spend 30 minutes in a Piazza and just watch. It’s all there. The most beautiful Piazza in Rome is Piazza Navona. Day and night, this classically beautiful oblong baroque urban enclosure is filled with musicians, artists, mimes and street vendors and the best people watching in the city. Just grab a seat at any of the cafés decorating the perimeter of the square. 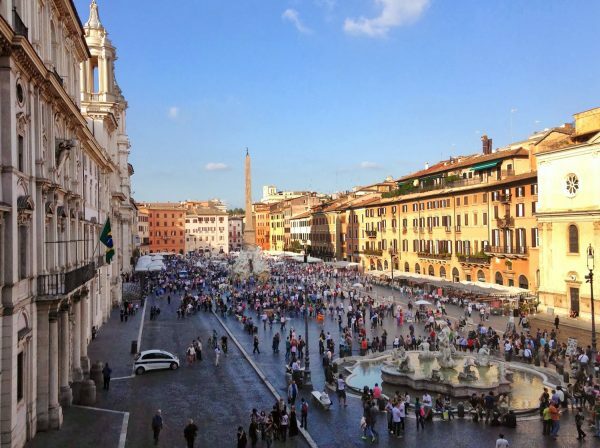 They have names like the Bernini Restaurant, 4 Fiumi, Caffe Domitziano and Vacanza Romane, names that evoke the history of the Piazza in a grand tourist seduction. The oldest of them is the Caffe Tre Scalini. It’s been here since 1815. Tre Scalini put itself on the culinary map of Rome in 1946 when Francesca Colasanti-Ciampini mixed 13 varieties of Swiss chocolate into a frozen dessert that resembled a chocolate truffle. I think the real secret is how she was able to get 13 varieties of Swiss chocolate in post World War II Rome. Of course no famous Italian culinary invention is without controversy. The De Maria family from the Calabrian town of Pizzo claims Don Pipo De Maria invented the frozen truffle in 1952 as a treat for a wedding reception for a relative of King Emmanuel II. There are a number of Gelaterie in Pizzo serving the famous tartufo ice cream. You’ll have to try them both in order to decide which is better. The entertainment never stops in Piazza Navona. As day becomes night the sodium vapor streetlamps cast an eerie glow over the Piazza. 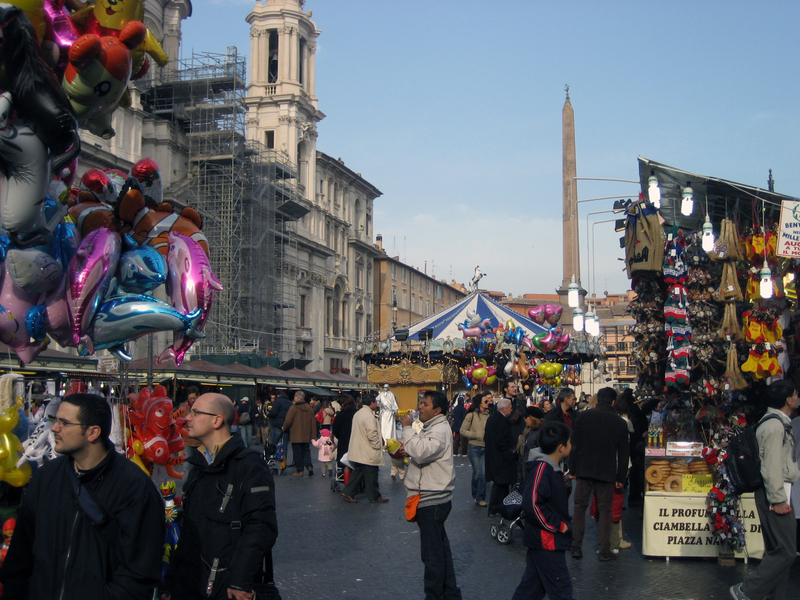 Over the centuries, Piazza Navona has become a favorite haunt for some of the ancient ghosts of Rome. You could be pinched by the ghost of Valeria Messalina, the third wife of the Emperor Claudius and one of Rome’s most famous sexual predators, or you might witness the ghostly carriage ride of Olimpia Maidalchini Pamphilj (the Pimpaccia) as she returns to the Palazzo Pamphilj, the scene of the crime where she stole the treasure of Pope Innocent X after his death in 1655. Another famous ghost story comes from the Palazzo de Cupis where these days you can rent a luxury suite/room at this recently renovated home of Costanza de Cupis (the ghost). The 17th century baroque Piazza Navona was commissioned by Pope Innocent X (Pamphilj). From 1644 till his death in 1655 he erected the Palazzo Pamphilj (now the Brazilian Embassy), the Church of Sant’Agnese in Agone and Bernini’s Four Rivers Fountain. Although building projects in the Piazza continued until the late 19th century, the origins actually go back to the year AD 86. It is truly amazing how many people walk through Piazza Navona without any idea of why it has this oblong shape. If you think it looks like a racetrack that’s because it was a racetrack. In AD 86, the Emperor Domitian built a +20,000 capacity Athletic Stadium that still serves as the foot print of the current Piazza. This video reconstruction of the Stadium of Domitian is worth a look to see how the Stadium played in the Piazza. The Greek word Stadium refers to the measurement roughly equivalent to 200 meters used for naked athletic foot races. 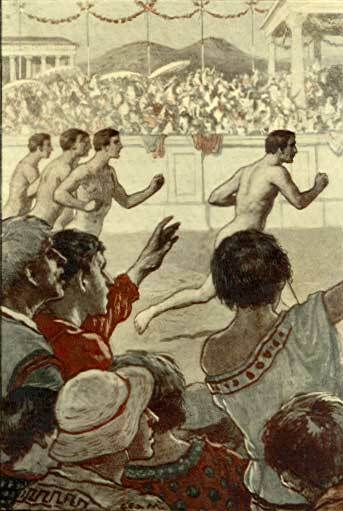 Greek foot races were traditionally run by naked athletes, an origin of varied explanations. The most believable is that ancient clothing was too restrictive. The most creative explanation involves a Greek athlete losing his loincloth and then tripping over it, prompting all the other athletes to remove their loincloths in solidarity. The events were known as Agone, the Greek word for physical struggle. After Domitian repaired the Temple of Jupiter Optimus Maximus on the Capitoline Hill he built the Stadium to celebrate the new Temple with the Ludi Capitolini, a festival of games in the Greek style, similar to the Olympic games. Domitian, like many other Roman elite, felt the Greeks were intellectually superior to the Romans. The word Agone evolved to n’Agona and then, thanks to the Roman dialect, further evolved into Navona. 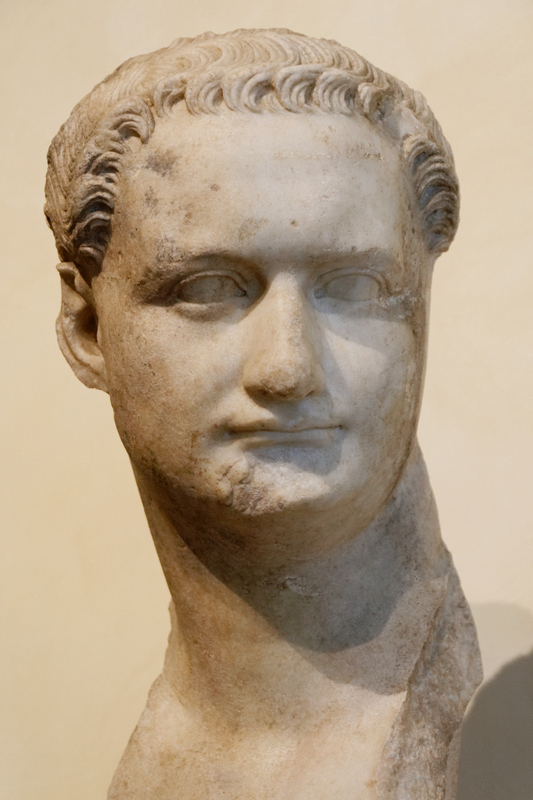 Domitian was the 11th Emperor of Rome and the last of the Flavian Dynasty. His father, Titus Flavius Vespasianus (Vespasian) gave the people of Rome the Temple of Peace, pay toilets and the Flavian Amphitheater (The Coliseum), although he never lived to see it completed. His son Titus Flavius opened the Flavian Amphitheater (Coliseum) with 100 days of entertainment, built a Bath Complex on the Oppian Hill, threw a lot of wild parties and died after 2 years in power. The purple robe of power was transferred to the younger son, Titus Flavius Domitianus (Domitian) in AD 81. During Domitian’s 15 years in power he became the Empire’s chief builder of Flavian propaganda. He built Triumphal arches to his brother Titus and added waterproofing to the coliseum for naval battles. He built a Temple in the Forum dedicated to Vespasian and Titus and the Flavian Mausoleum on the site of the family home on the Quirinal Hill. 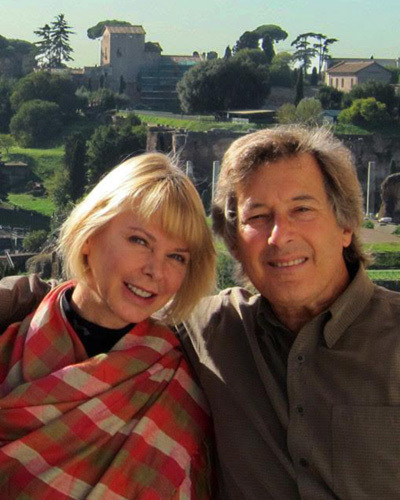 He built the Stadium that is now Piazza Navona and the Odeum concert hall next to the Stadium. He rebuilt the Temple of Jupiter Optimus Maximus on the Capitoline Hill and many other temples and buildings damaged from the AD 80 fire. He built a country Palace in the Alban Hills, now Castel Gandolfo. It used to be reserved for the pleasure of the Popes. Castle Gandolfo has been the Papal summer home since 1626, but thanks to Pope Francis, the gardens and remains of the Domitian Palace are open to the public. However, all this Flavian propaganda was nothing compared to his crowning achievement, the massive Domus Flavian that still outlines the Palatine hill. The building was so large it gave birth to the word Palace. Domitian might have considered himself a benign Monarch and supreme builder but his total disregard and distain for the Senate ended up causing a political struggle that eventually killed him. He knew they were plotting against him. As the years went by he became increasingly paranoid. He even ordered the pillars of his Palace to be mirror polished so he could see when his enemies were about to strike. It didn’t work. He was killed in a conspiracy carried out by his court officials. Upon his death, the Senate passed a Damnatio Memoriae, a Damnation from all memory. All statues and dedications to Domitian were permanently removed from history for all eternity. It apparently wasn’t enforced too strongly since we know quite a bit about the Emperor Domitian. Domitian’s Stadium of naked athletes never really caught on with the Romans. Naked men running around a track just wasn’t exciting enough to a population raised on Chariot races and consequently, with the Damnatio Memoriae, the Stadium of Domitian followed the trend of Rome and became the Circus Agonalis. Circuses were built for Chariots. In the words of the 2nd century poet Juvenal, the only care of the Roman people was panem et circenses, bread and circuses. In many ways he was right. After a fire damaged the Coliseum in 217, the Circus Agonalis (Stadium of Domitian) became the alternate site for gladiatorial events and public executions. When Emperor Severus Alexander repaired the Stadium in 222, he renamed it the Circus Alexandri. Alexander was 14 years when he became Emperor and 26 when he was killed and replaced by the 8’6” (2.5 meter) tall Maximinus Thrax. These days you have to go out of the Piazza Navona to see the ancient remains of Domitian’s stadium. If you walk north towards the Neptune fountain and exit the square into the Piazza Tor Sanguine. Quickly turn left you can see one of the arches under a 1930’s bank building. Continue to the left and follow the curve of the stadium. Keep to the left and you’ll soon find yourself at the entrance of the new Stadio Domiziano Museum, opened in 2014. This is the best place to see the vaults below the seating tiers. The Stadio museum concentrates it’s exhibition on the years when the stadium was a gladiator venue after AD 217. Gladiators still draw the best crowds. However, the museum is a wonderful look at the arches under the stadium. In the 3rd century these vaulted rooms were used for some very famous brothels. The museum is open everyday from 10am till 7pm and till 8pm on saturdays. The ticket price is €8 and includes an audio guide. Between 1936-38, Benito Mussolini was inspired to reveal the ancient monuments of the city, an effort to tie the glory of ancient Rome to the future glory of Mussolini’s Third Rome. It was during this period when he created the via dei Fori Imperiali to the Coliseum, the via Conciliazione to St.Peter’s Basilica and the Piazza Augusto Imperatore by the Mausoleum of Augustus and Ara Pacis Museum. 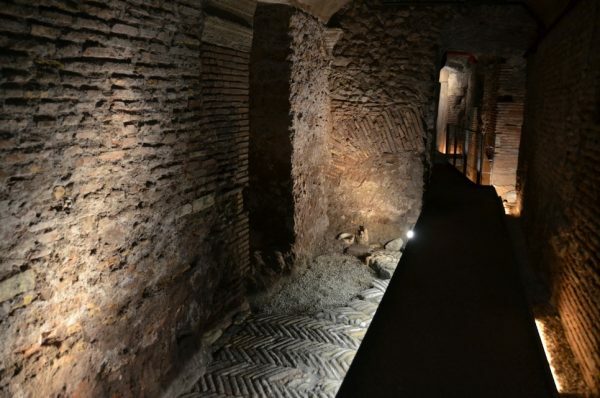 During this same time excavations were made in the Piazza di Tor Sanguina to reveal the ancient Stadium of Domitian. 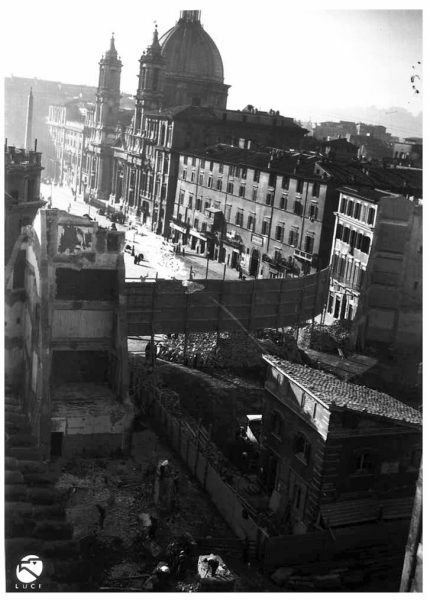 The urban architects planned to raze the buildings along the via Giuseppe Zanardelli, creating an open view from the ancient stadium to the Tiber River. The project was aborted but it did open up the arches we see today. 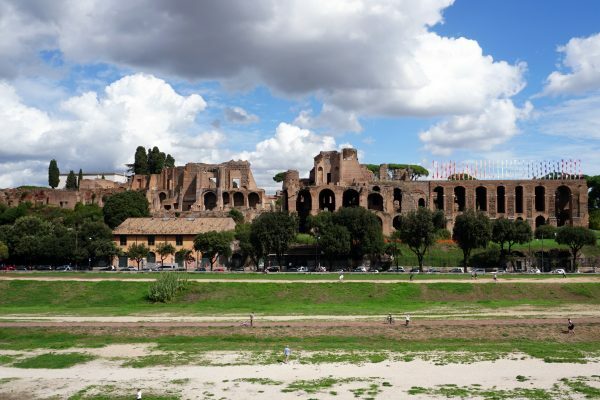 During the Middle Ages, the Stadium/Circus was used for jousting matches but as the Renaissance began to spread across Italy in the 15th century, the marble was dismantled and thrown into the lime kilns, melted down to rebuild the city we see today. By the mid 15th century, the racetrack still defined the oblong shape of the Piazza but new buildings were erected over the seating tiers and arches that once held between 20,000 and 30,000 spectators. The Church of San Giacomo degli Spagnoli (Santiago de los Españoles), the national Church of the Spanish community in Rome was built in the mid 15th century. You can see it in the 16th century perspective drawing above. 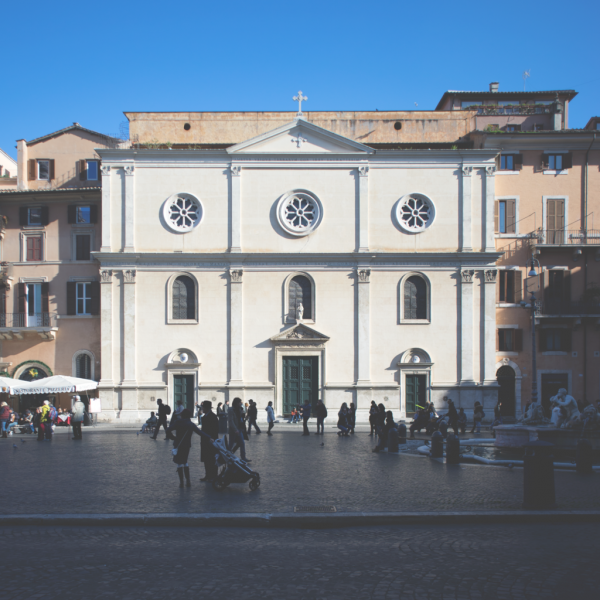 The Church is still in Piazza Navona although it is now known as La Nostra Signora del Sacro Cuore (Our Lady of the Sacred Heart). In 1495, the Palazzo de Torres was constructed near the San Giacomo degli Spagnoli for the De Torres family, wealthy merchants from Malaga, Spain. By the middle of the 16th century, the de Torres married into the Lancelloti family and in 1552, Pirro Logorio (most famous for the fountains at Villa d’Este in Tivoli) renovated the Palazzo Torres into the The Palazzo Torres Massimo Lancelloti we see today in Piazza Navona. Piazza Navona held a large Spanish community in the 16th century until most of them moved to the Piazza di Spagna in the late 17th century. The Spanish community introduced the first Easter Parade in the Piazza in 1579. This 1650 illustration below shows a completed version of the 17th century Piazza Navona. The Palazzo Pamphilj, on the lower left, was finished in 1649 but the Four Rivers Fountain wasn’t completed until 1651 and the Church of Sant’Agnese in Agone wasn’t completed until 1676. The finished Church looks a lot different than it does in this drawing. 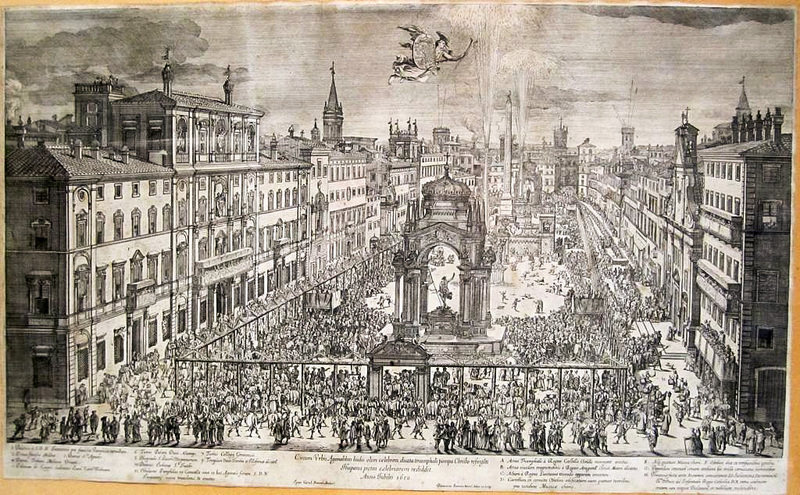 Piazza Navona – Dominique Barrière – Jubilee of 1650. The Palazzo de Cupis, once a haunted house and now a luxury hotel was also built in the second half of the 15th century. In the early 1600’s, Costanza de Cupis was regarded as one of the most beautiful women in Rome, especially for her hands. In fact her hands were so beautiful, one of them was copied in stone by a local sculptor and displayed in his studio. One day a stranger came into the artist’s studio and after looking at the hand for a few moments, he told the artist that the woman who it belonged to would lose it. A short while later, while Costanza as was doing some needlepoint, she pricked her finger with the needle. A few days later it became infected. A few weeks later it got so bad, the hand was amputated, but it still didn’t stop the infection. Soon after the amputation, Costanza de Cupis was dead. Her ghost has been seen sitting inside one of the windows of the Palazzo. If you do rent a room in the newly renovated luxury Palazzo de Cupis, be sure to ask which room was occupied by Costanza. The statue of Pasquino, the most famous of the talking statues of Rome originally came from the Stadium of Domitian. 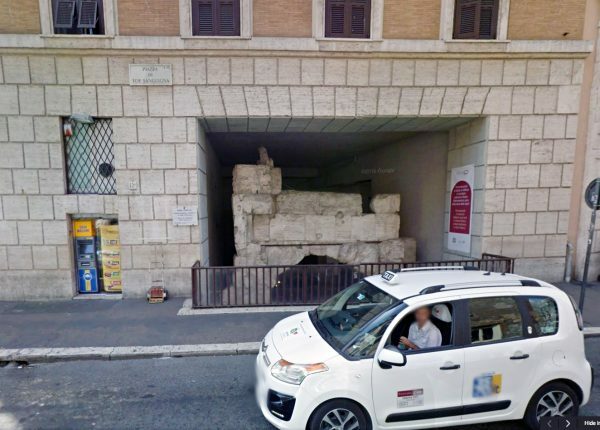 In the early 15th century he was propped up in what is now known as the Piazza di Pasquino, close to the Palazzo Braschi, the current Museum of Rome. For over 500 years he became the symbol of civil protest, making irreverent barbs and insults towards Popes and Politicians. 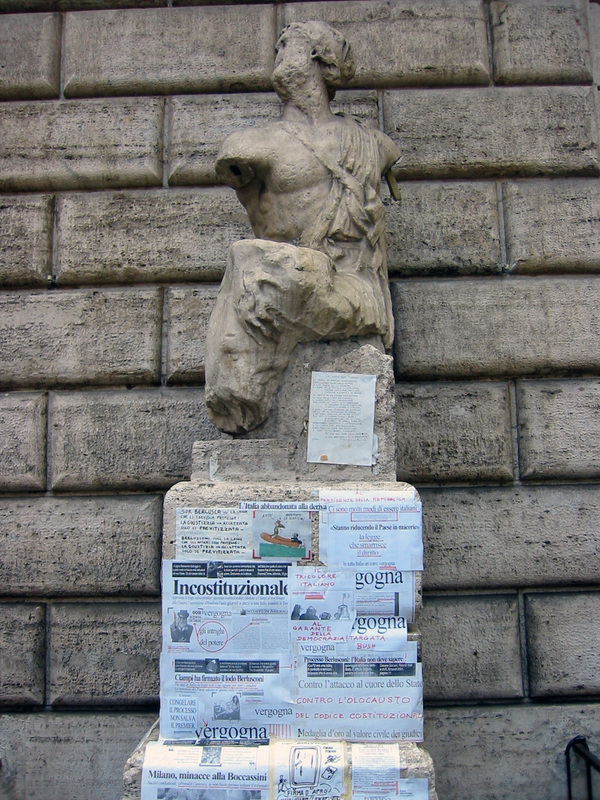 In 2010, Rome initiated a flight against graffiti, which included cleaning up all the talking statues. Although it is currently against the law to post notices without first obtaining permission, every once in awhile someone will still stick a protest onto the plinth of Pasquino. By 1485, the Piazza was paved. 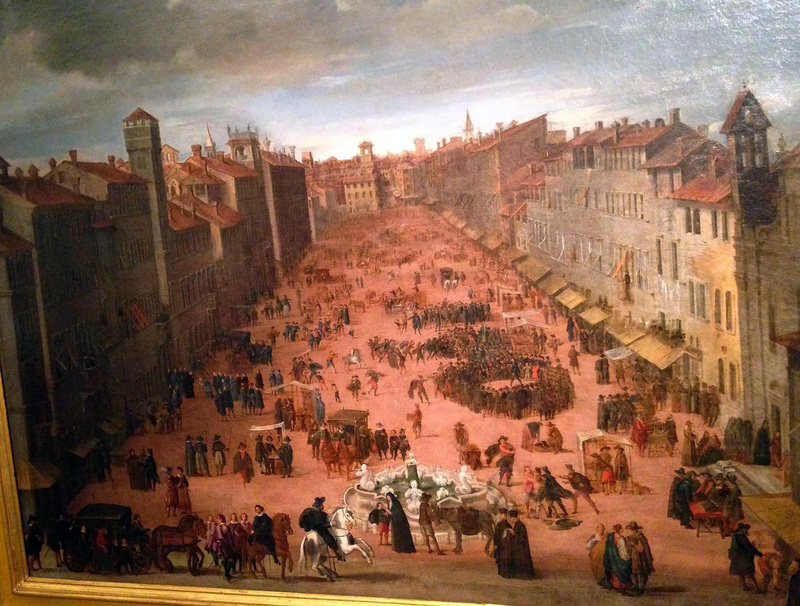 The Campidoglio had provided daily food markets for many years but the city was growing. The markets needed a larger space. 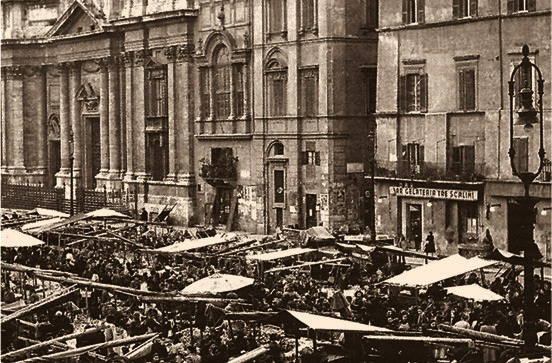 Markets provided the daily necessities to the citizens of Rome and a good income for the Church. Vendors paid high prices (or bribes) in order to get the best positions. However, over the years, the invasion of contortionists, acrobats, fire eaters, beggars, thieves, con artists and piles of garbage caused Pope Innocent X (Pamphilj) to shut it all down in 1644. Coincidently, this was at the same time the Pope was planning to turn Piazza Navona into his personal living space. When Innocent X died in 1655, the markets briefly returned but so did the same problems. 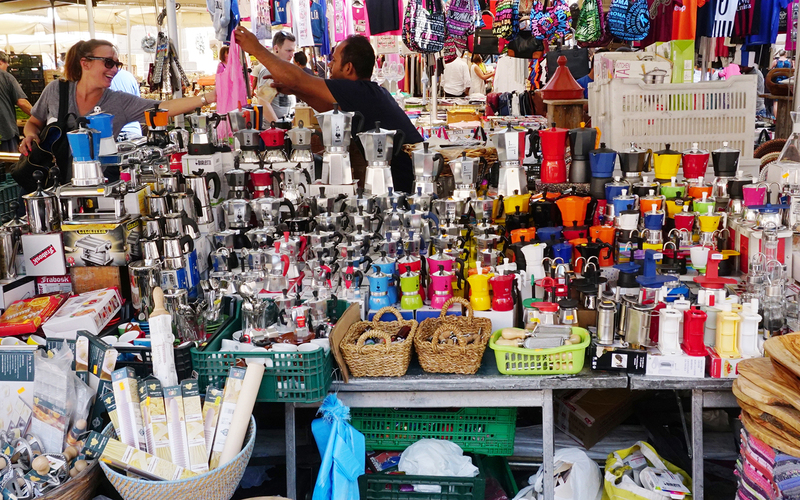 These days the largest daily outdoor food market in the city is in Campo dei Fiori, about 700 meters away. It’s the largest market in the city, filled with food, clothing, flowers, hustlers and lots of garbage. The new Mayor, Virginia Raggi (since June 2016) won her election on her promise to clean the garbage off the streets. She won the election but the garbage problem got worse. Garbage is a problem all over Italy. Amounts increase, the dumps are full and the companies running the clean up have suspected ties to criminal organizations. It’s not an easy fix. The only market left in Piazza Navona is the annual Christmas Market. It’s been a Roman tradition for many years and the best place to buy figurines and scenic elements for your Presepio (Christmas manger scene). 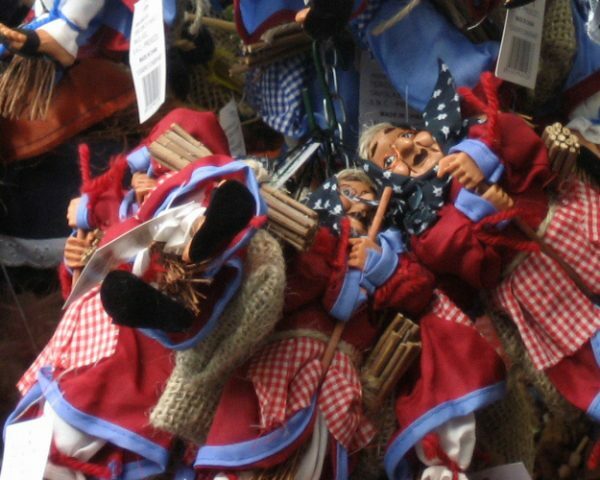 These days the Christmas Market is often called the La Befana market because of the abundance of La Befana dolls for the Epiphany. The Befana is a Disneyesque witch who flies over the houses of Italian children on January 6th (the Epiphany). Good children get gifts. Bad children get coal although these days it’s candy coal, also for sale. The 21st century Christmas market is more of a carnival atmosphere with carousel rides and cheap toys made in China. In 2015 the Christmas Market was investigated for corruption when it was discovered that more than half of the awarded contracts went to the politically connected Tredicine family. Tredicine runs most of the chestnut roasters, clothing stalls and food kiosks around the city. It’s politics as usual in Rome. 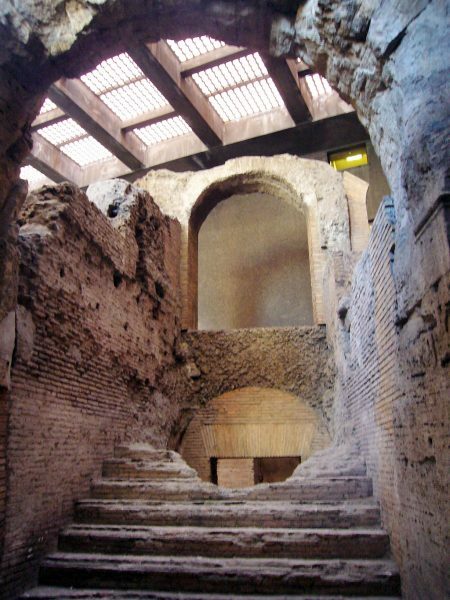 By the 3rd century, much of the lure of Domitian’s Stadium involved the brothels, the dens of sexual fantasy under the arches beneath the seating tiers. It’s interesting to note that the Latin word Forniacatio means ‘things that take place under the arches’. The word became fornication in English. We know more about the brothels than the foot races thanks to the story of Saint Agnes. She was born at the end of the 3rd century to a noble Roman family and according to Christian history she was killed at age 12 or 13 after refusing to marry any of the suitors set before her. The dejected men consequently submitted her name to Emperor Diocletian as a Christian. Diocletian really had it in for the Christians. This is where the story gets weird, or interesting if you happen to be a Christian. She was dragged naked to one of the brothels in the Stadium of Domitian. According to Christian lore, she prayed so piously that hair grew all over her body but her hirsute appearance wasn’t enough to repel all of the drunken Romans of the brothel. However, any of them who did try to defile her were struck blind. Eventually Agnes was condemned to death by fire but the wood wouldn’t light. When they finally got the wood to light the flames wouldn’t touch her. Exhausted from failed tortures, the Roman officers beheaded her. The year was AD 304. Agnes was buried in the Sant’Agnese Catacombs on the via Nomentana. The burial site is still there and now open to the public. You can get a ticket through the Church of Sant’Agnes fuori le Mura directly next to the subterranean cemetery. 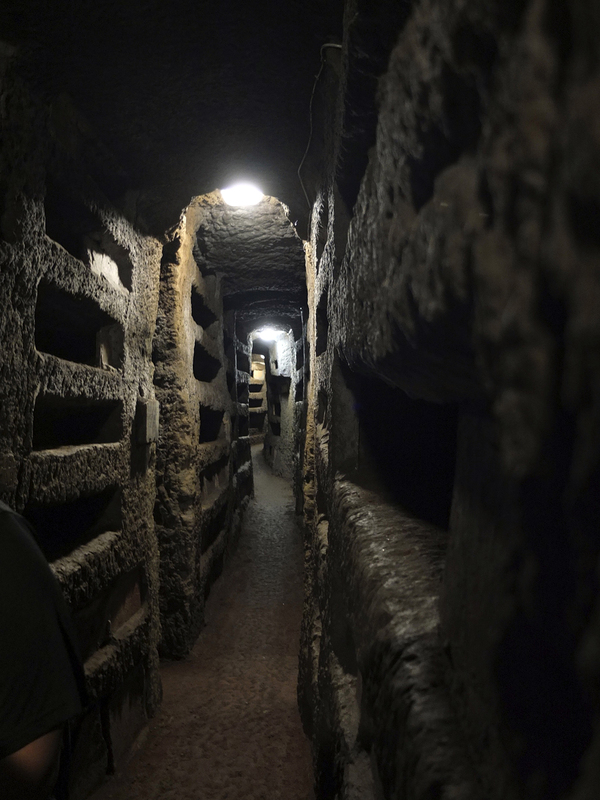 The catacombs and the Church are also next to Constantine the Great’s 4th century mausoleum dedicated to his daughter Costanza, or maybe his wife, Helen. The jury is still out on this one. The Church of Sant’Agnes fuori le Mura was consecrated in the 7th century. It’s one of the oldest churches in Rome. 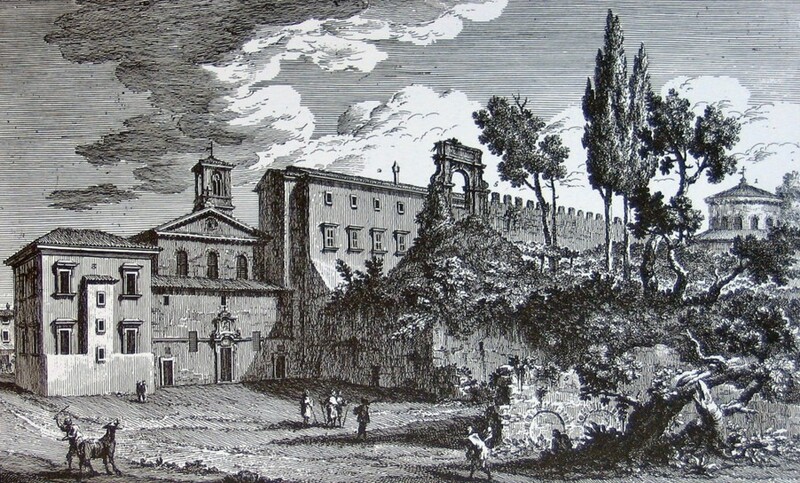 In the etching above by Giuseppe Vasi you can see the original church in relation to the Aurelian wall and the Mausoleum of Costanza. 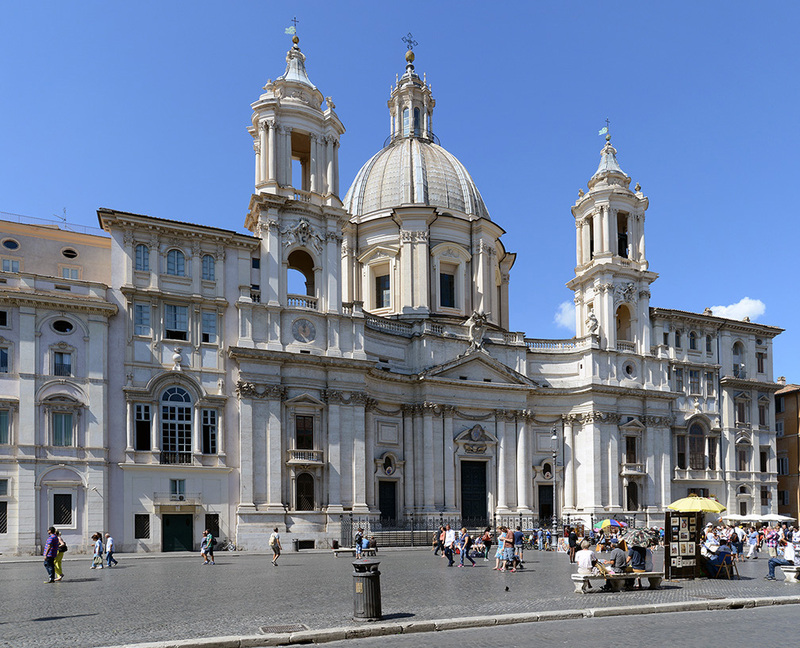 When the first church of Saint Agnes in Agone was consecrated in the 1123 by Pope Callixtus I, half of the remains of the Saint were sent over to Piazza Navona. 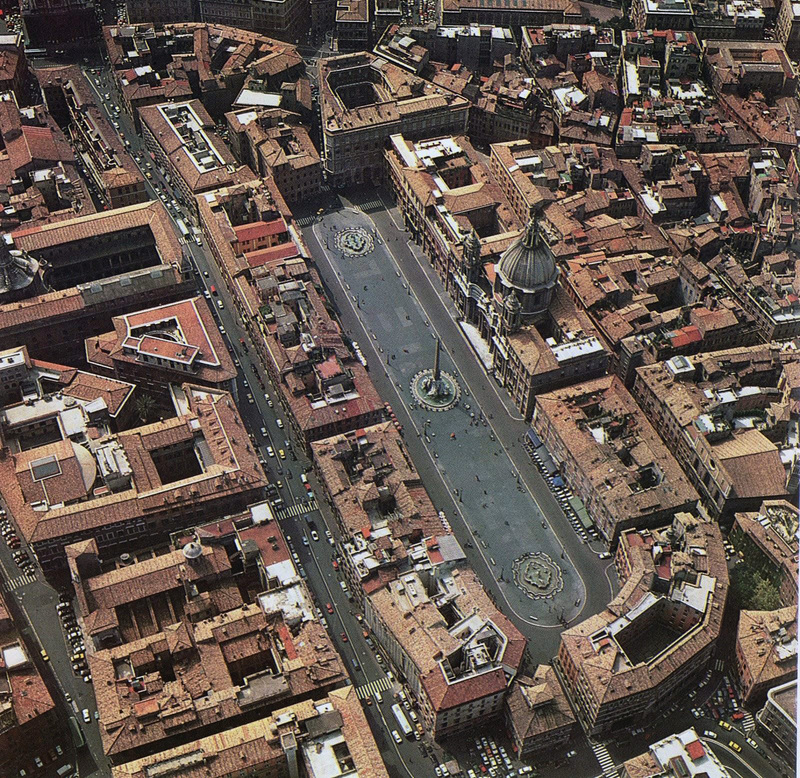 In 1644, the newly ordained Pope Innocent X (Pamphilj) laid out his plans for his personal legacy in the Piazza Navona. A newly built Church of Sant’Agnese in Agone would be the Pamphilj family church conveniently connected to his new Palazzo Pamphilj. 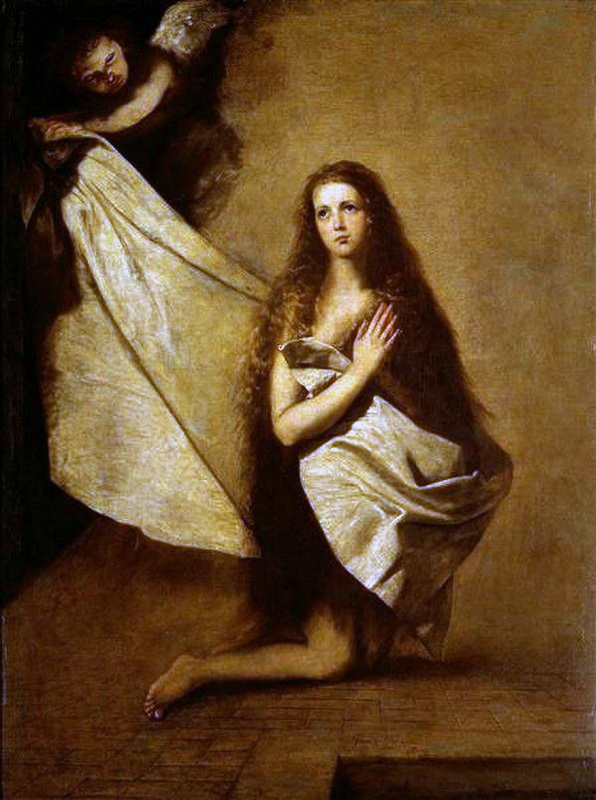 Saint Agnes was going to get a new home. Work on the new Church began in 1652 under the direction of Girolamo Rainaldi, one of Pope’s favorite architects. A year later in 1653, Rainaldi was replaced by Francesco Borromini, who trashed Rainaldi’s designs and created his own for the church façade. When Pope Innocent X died in 1656, the project was taken from Borromini and handed to Carlo Rainaldi (son of Girolamo). Carlo threw away a lot of Borromini’s designs and replaced them with his own. 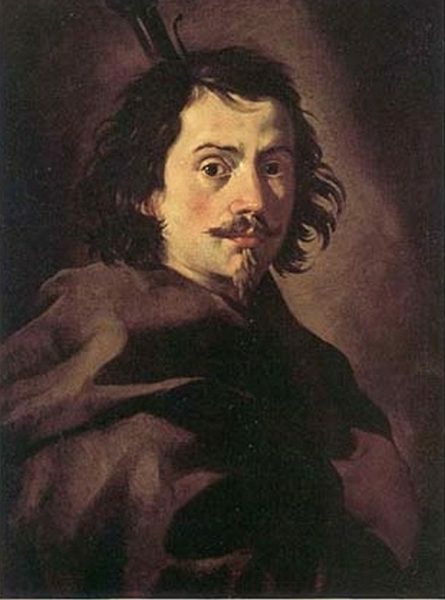 In 1666, Gianlorenzo Bernini was brought in to consult on the Church. He made alterations to Borromini’s façade, a final insult to his greatest rival. The Church was finally finished in 1676. It all blends together even though it’s a mishmash of conflicting direction. The confusion extends to the High Alter dedicated to Saint John the Baptist instead of the patron Saint of the Church, Saint Agnes. The church remained in the Pamphilj family till 1992. No longer able (or willing) to pay for the upkeep of the Church, the family donated it to the Diocese of Rome. If you take a tour of the Church you’ll be able to go down to the crypt and to the location where (supposedly) Agnes was killed. In 1644, Girolamo Rainaldi and Francesco Borromini began work on the Palazzo. Designs were drawn and by 1646 the work began. The working relationship between these two architects was easier on this project because Rainaldi as Chief Architect was able to keep his control over Borromini. Consequently the Palazzo was completed in less than 4 years. It took the same amount of time for Pietro da Cortona to fresco the life of Aeneas onto the Gallery vault of the Palazzo. At night when the lights are left on, you can see parts of the da Cortona fresco. The view is much better is you take the tour through the building. Pope Innocent X and his sister-in-law/lover/confident/advisor, Donna Olimpia Maidalchini lived in the Palazzo from around 1653 to 1655. 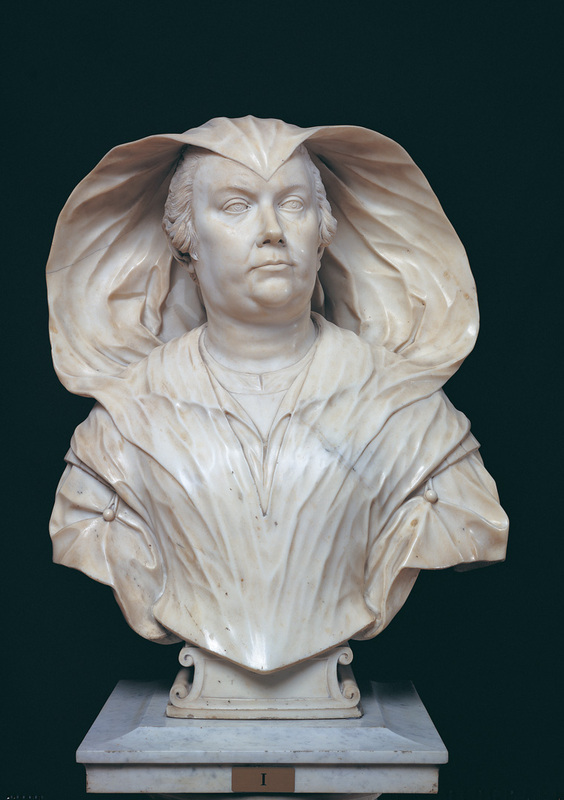 Maidalchini maintained so much power over the Pope she was often referred to as Popessa. However, the name that really stuck was “Pimpaccia”. Pimpa was a common expression for a plump woman. In Roman dialect, or most Italian dialects, just add the suffix ‘accia’ to the word and you can turn any noun into a degrading noun. When Innocent X died on January 7, 1650, the Pimpaccia grabbed the Pope’s treasure and skedaddled out of town. With no money to pay for the papal funeral, the Pope remained dead in his bed for 3 days before the expenses were finally paid by his butler. 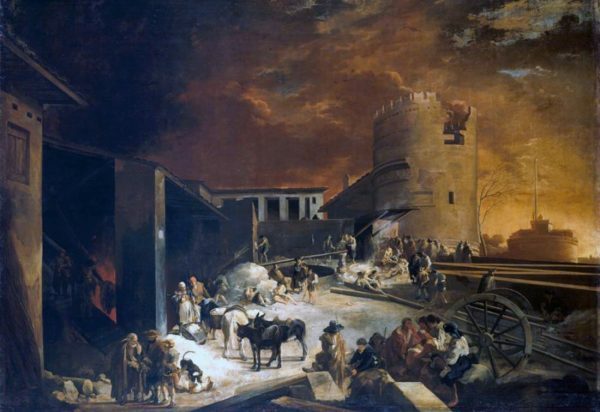 The robbery of the Papal treasures is one of the great ghost stories of Rome. Over the years the ghost of the Pimpaccia appears in her ghost carriage crossing the Ponte Sisto bridge out of town with the Papal treasure. In 1960, the Republic of Brazil purchased the Palazzo. It has been the Brazilian Embassy ever since. 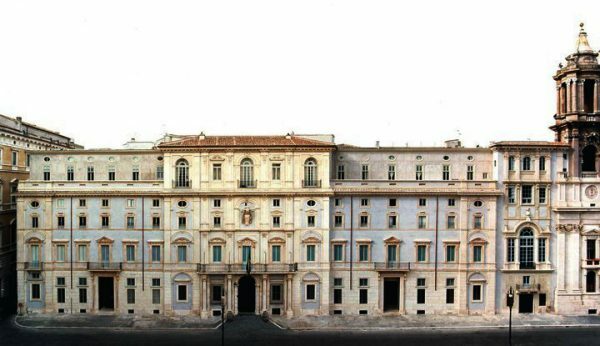 It’s interesting to note that all Papal seals have been removed from the Palazzo façade. I have asked people in the Brazilian embassy why the Papal seals were removed but no one seems to know. One answer I got was they were removed to end the haunting of the Palazzo by the Pimpaccia. The tour takes you to see the Life of Aeneas fresco by Pietro da Cortona and a lot of the rooms of the Palazzo, including the bedroom of Donna Olimpia Maidalchini, the Pimpaccia. Rome has more fountains than any other Italian city, actually more than any other city in the world. Every Piazza is defined by a fountain. In the 5th century Rome had 1,212 fountains. After Vitiges and the Ostrogoths knocked down most of the Aqueducts in the 6th century there were barely 100 fountains remaining. Today there are 50 decorative fountains in Rome but when you add in the small wall fountains and the ubiquitous Nasone drinking fountains there are over 2,000 of them flowing all day and all night. The Aqua Virgo Aqueduct, built in BC 19 by Marcus Agrippa, was restored in 1453 to provide water to the Trevi Fountain and the Piazza del Popolo. In 1570 the Aqua Virgo, now called the Aqua Vergine, was extended by Pope Gregory XIII to Piazza Navona. 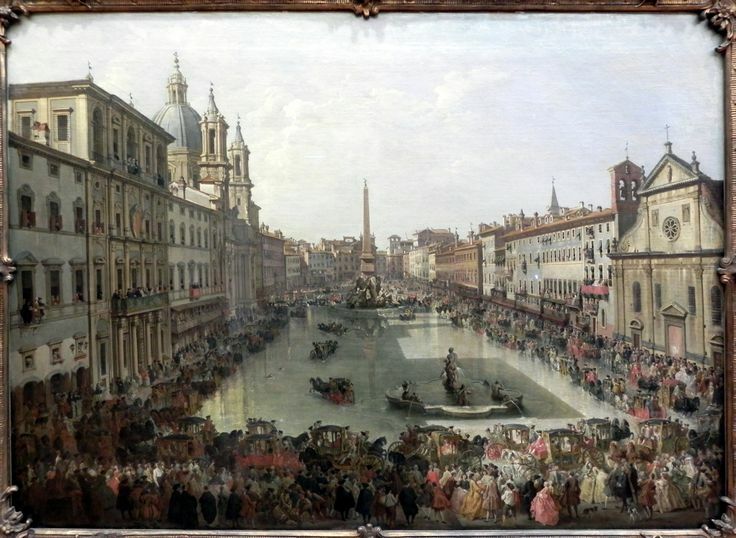 Pope Gregory XIII commissioned Giacomo della Porta to design and build three fountains in Piazza Navona to enhance the marketplace. They were all constructed between 1575 and 1576. 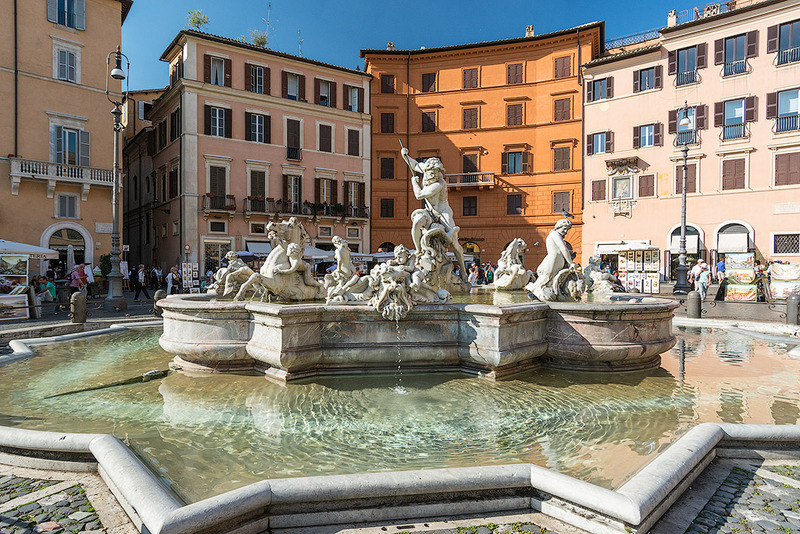 In 1575, Giacomo della Porta created the double basin fountain now known as the Moor Fountain. 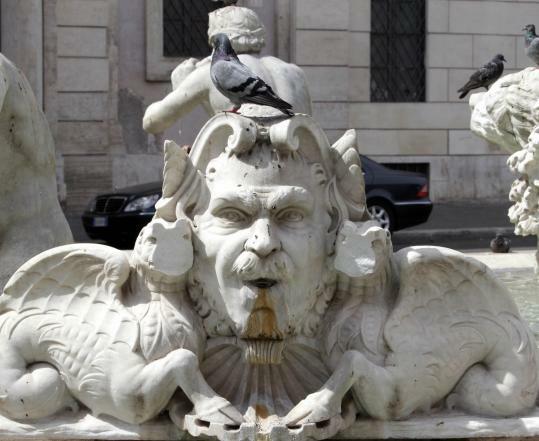 Since this fountain was closest to the entrance of the Piazza, della Porta embellished it with four grotesque masks, four Tritons blowing water through conch shells and a dolphin on a conch shell as the centerpiece of the upper basin. 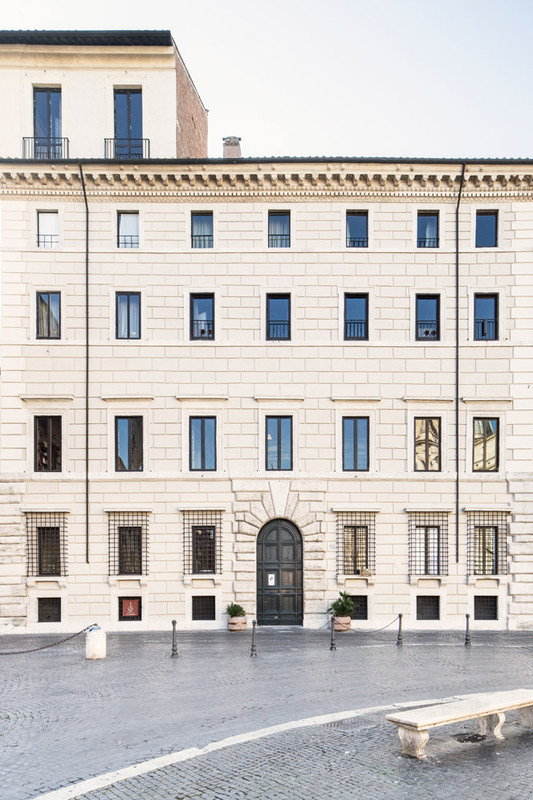 In 1649, the fountain sat directly below the windows of the Palazzo Pamphilj and when Pope Innocent X (Pamphilj) and Olimpia Maidalchini moved in that year they wanted it updated. And so they threw money at Gianlorenzo Bernini. The 1653 Bernini design included a large Triton wrestling the dolphin in the center of the fountain. At this point in Bernini’s life, he designed projects but very rarely did the sculpting himself. He left that up to the craftsmen in his studio. No one knows if it was intentional or not but when the Triton was finished his facial features were very African. The Romans referred to the statue as the Ethiopian and then the Moor. It’s been the Moor ever since. On September 3, 2011 a vandal defaced one of the grotesque masks by beating it senseless with a rock and knocking off both its ears. Luckily they were clean breaks and the ears were reattached. It was also fortunate that the small triton statues and the grotesques are copies put on the fountain in 1874. The worn originals were removed to the Galleria Borghese and placed in the Giardino del Lago in 1909. In 1575. Giacomo della Porta created another double basin fountain in the north end of the Piazza. 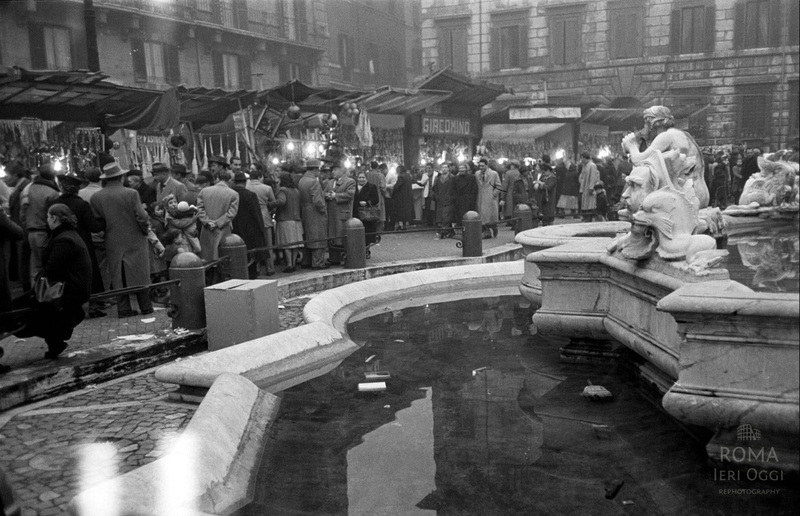 At the time it was known as the Fountain of Coppersmiths (Fontana dei Calderai) because of all the tinkers and coppersmith shops who worked in the nearby alleys. The double basin made it accessible to the coppersmiths as well as thirsty horses and livestock. When Bernini was working on the Moor Fountain in 1653, he tried to convince Olimpia Maidalchini and Pope Innocent X to add money to update the Coppersmith fountain as well but the Pope lost interest in building projects because of failing health. Olimpia Maidalchini lost interest because she was now concerned with keeping the money for herself. The Fountain of the Coppersmiths remained a simple double basin until 1873 when it was selected by the Italian Reunification for urban renewal. A design contest was held. The winners were the Sicilian, Gregorio Zappalà for his mermaids, dolphins, sea horses and cherubs and the Roman born Antonio della Bitta for his centerpiece sculpture of Neptune wrestling with a giant Octopus, the namesake of the newly christened ‘Neptune Fountain’. Zappalà proposed a female Moor to tie into the Moor fountain at the southern end of the Piazza but della Bitta’s Neptune won the prize. As the Calderai Fountain was getting updated, the tritons and grotesques of the Moor Fountain were removed and copies were installed. The third della Porta fountain was built between 1575 and 1576. It was also most likely another double basin fountain used to water livestock in the marketplace and provide water for the citizens who lived near the Piazza. This fountain became the location for the Bernini’s Fontana dei Quattro Fiumi, the fountain of Four Rivers, a masterpiece of art and engineering and the centerpiece of the Piazza Navona. There is a famous story regarding the rivalry between Gianlorenzo Bernini and Francesco Borromini. According to one version of the legend, Bernini positioned the Rio de la Plata River god of the Four Rivers Fountain with a hand shielding his eyes from Borromini’s façade of the Church of Sant’Agnese in Agone, almost in a pose protecting himself from the impending doom of the collapsing façade . 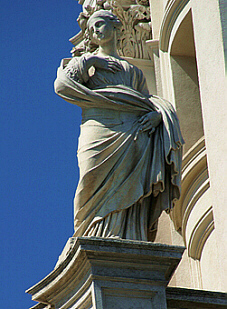 Atop the Church, Borromini’s statue of Agnes prepares to lift her skirt towards the fountain in a rude gesture of disapproval. It’s a great story, and there are a few different versions of it, but none of them are true. 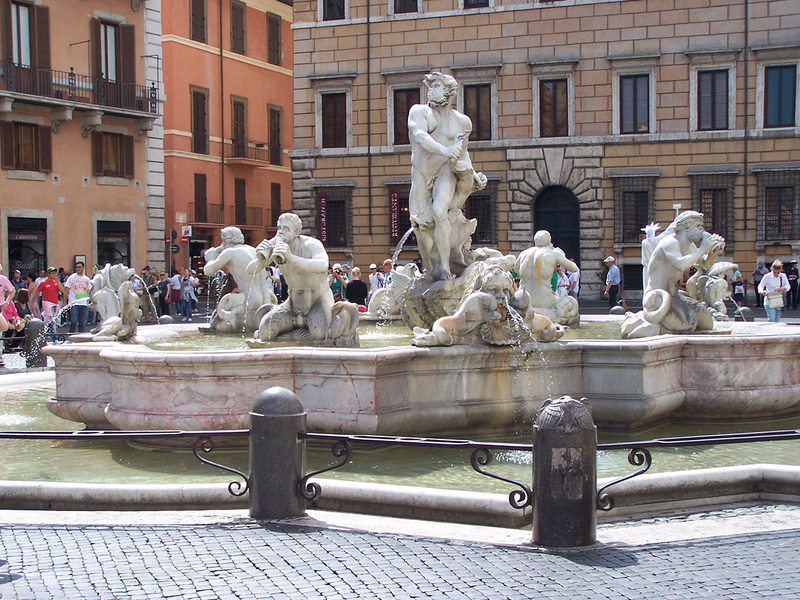 The Bernini Fountain (1651) predates the Church façade (1653) by 2 years. 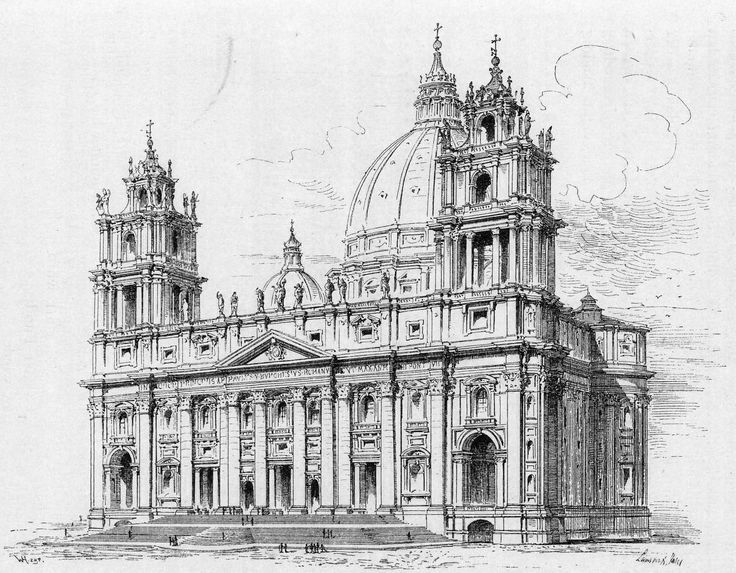 It’s also worth noting that the final design of the façade of Sant’Agnese in Agone was done by Bernini. He was brought in in 1666 and altered Borromini’s design. Nonetheless, the rivalry between Bernini and Borromini was real and even today, often exaggerated. 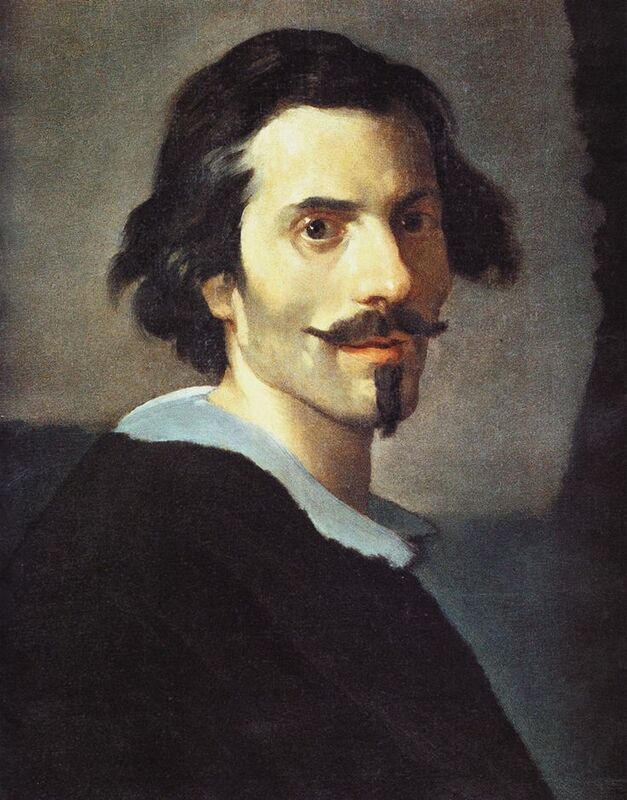 Bernini was jovial, friendly, witty, handsome and by far the most talented man in Rome for much of the 17th century. Even after losing the use of his right arm from a stroke at age 80, he still worked for another 2 years, stopping two weeks before his death in 1680. He defined the Baroque period and was Rome’s master architect and sculptor for over 60 years. In my opinion, he is still the greatest sculptor of all time. Borromini was a great sculptor and a brilliant architect. His Church of St Ivo is a masterpiece of intersecting geometric shapes but his personality could not have been more opposite to Bernini. He stayed to himself. He was argumentative, pensive, joyless, jealous, grouchy and depressed. In 1667, at age 67, he took his own life, falling on his own sword. Although Gianlorenzo Bernini was the Papal sculptor and architect through three Popes between 1621 and 1667, his illustrious career was marred with a crack in one of the towers of the façade of St Peter’s Basilica, a crack large enough for Francesco Borromini, Girolamo Rainaldi and other adversaries to move from second best to most favored status for the Pope’s new projects. It was later discovered the cracks were caused by the faulty foundation of Carlo Maderno’s façade of St. Peter’s but by then the Bernini’s towers were removed and the damage was done. Rainaldi and Borromini might have become the favorite architects of Pope Innocent X (Pamphilj) but Bernini would not go away quietly. When Pope Innocent X called for a contest to design a fountain in front of the Church of Sant’Agnese he called upon all the great architects, sculptors and designers of period, all except Bernini. 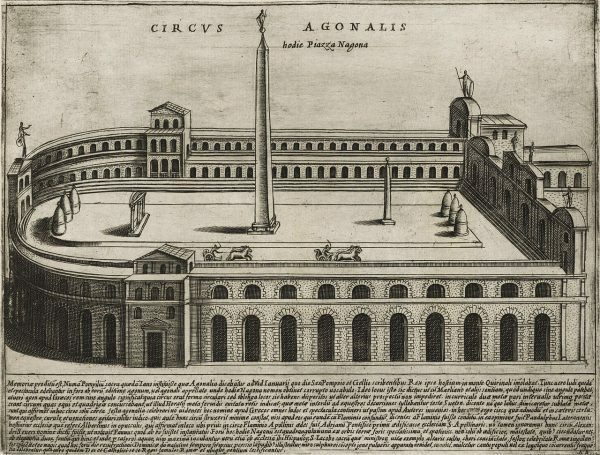 His only request in the design was to include an Egyptian obelisk from the Circus of Maxentius on the Appian Way. 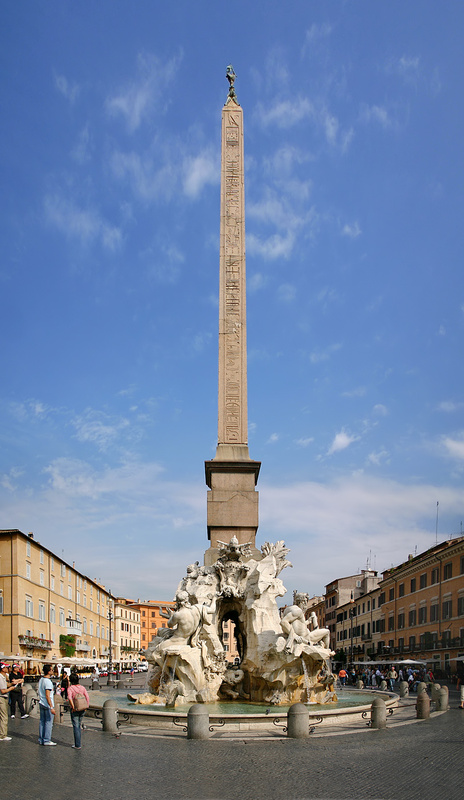 It was a common theme for Popes of the 16th and 17th centuries to show Christianity triumphing over pagan symbols by using an Obelisk. Borromini claimed that his design based on the four great rivers of the world won the contest. He also claimed Bernini saw the drawing and stole the idea. Instead of creating another drawing, Bernini decided to make a model, and instead of a simple terracotta model, he made it of silver. Now he had to get it to Pope Innocent X.
Bernini was friendly with Prince Niccolo Ludovisi, the nephew of Donna Olimpia Maidalchini, the power behind the throne of the Pope. 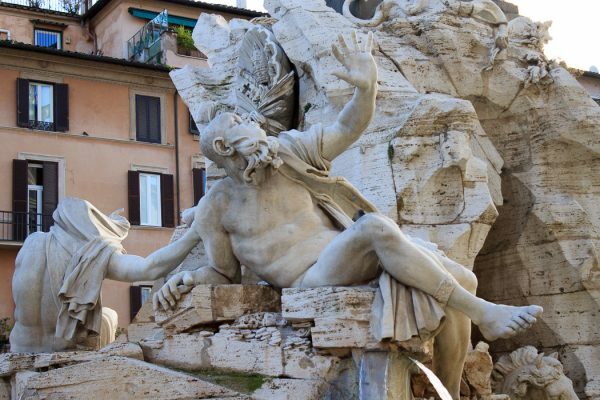 The flirtatious and charming Bernini had no problem bribing his way into her confidence. Olimpia Maidalchini was so delighted with the silver model she agreed to help him secure the commission. As the Pope was arriving to dinner, the model was strategically placed on a hall table. The Pope had to pass in order to get to the dining room. Not only did the Pope see it, according to eyewitnesses, he was sent into a state of near ecstasy for a half hour and finally acknowledged the design could come from no one else but Bernini, and now that he’d seen it, he had to have it. The Four Rivers Fountain is one of Bernini’s greatest achievements, four river gods in a grotto surrounding a seemingly unsupported 54.2’ tall Egyptian obelisk. The river gods represented the Nile (Africa), the Danube (Europe), the Ganges (India) and the Rio de la Plata (Americas). The dove and olive branch Papal seal of Innocent X at the top of the obelisk was meant to show the power of Christianity over the ancient pagan symbols, but what the Pope never realized was that he brought Domitian’s obelisk back to Domitian’s Stadium. The obelisk was brought to Rome from Egypt and then carved with hieroglyphs. The Papal seal of Innocent X sits on an Obelisk proclaiming Domitian as the eternal Pharaoh and Vespasian and Titus as gods. The obelisk was originally thought to be erected at the Temples of Isis and Serapes (now the Church of Santa Maria Sopra Minerva). Domitian rebuilt these temples after the Great Fire of AD 80. However, the origin of the obelisk has now moved to the Flavian Mausoleum that once graced the Quirinale Hill. It was moved to the Circus of Maxentius in the early 4th century. 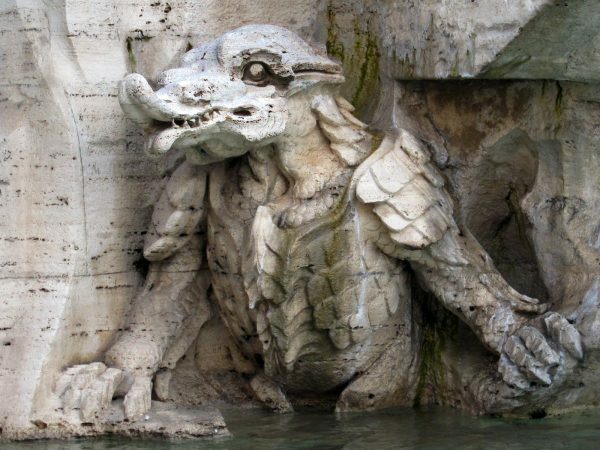 One of my favorite details of the fountain is Bernini’s image of an armadillo by the Rio del La Plata River god. Bernini had never seen an armadillo. His only point of reference was from crude drawings and details from people who had been on an expedition to the new world. The result is this fantastically strange monster. Pope Innocent X absolutely loved the Bernini’s fountain but Borromini remained a harsh critic. Bringing up the crack in the St Peter’s bell tower, Borromini began spreading the rumor that the unsupported obelisk would fall, that Bernini had made another error and the fountain would be doomed. The rumors grew louder until finally Bernini came to the Piazza to address the problem. He ordered his workers to attach 4 thin ropes to the top of the obelisk and then nailed each of the lines to four houses around the Piazza. He then got in his carriage and left. Everyone but Borromini had a good laugh. 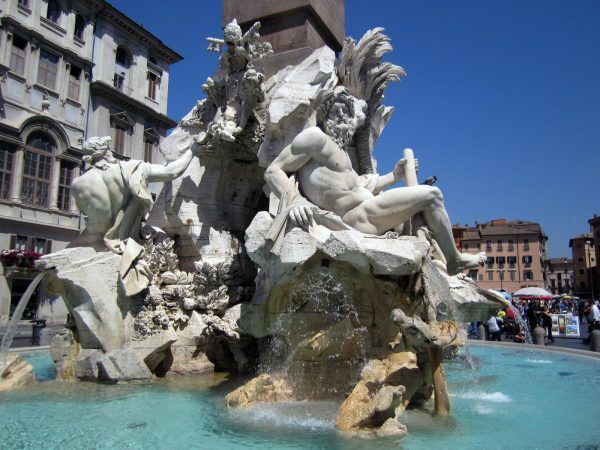 Bernini’s Four Rivers Fountain has been standing for 366 years. It has withstood storms, earthquakes, pollution, wars and thousands of tourists. And yet it still stands. Pope Innocent X taxed the hell out of the Roman people to built Piazza Navona and needless to say they weren’t very happy about it. But in the summer of 1652, the Pope made a gesture to express his thanks to the citizens of Rome and give them a little reprieve from the summer heat. He ordered the drains in all the Piazza Navona fountains covered. The cascading water flooded the Piazza. It was known as ‘Lago della Piazza’ (the lake of the Piazza). This tradition kept going till 1866.